Director Martin King has boldly tapped the vein of of 50s era B movies in his latest comedy feature "Attack of the Slime People." 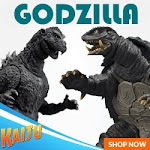 Though the film's title conjures up visions of goop covered monsters terrorizing wholesome Americans, that is not what today's film is about....well....not exactly. Enter Buddy Flavanoid (Played by Robert Tiffi), an over the top film maker with an unquenchable lust for young starlets and psychotic ambitions to become Hollywood's top director. Modeled in the vein of legendary film maker Ed Wood, Flavanoid is a collection of cliche characters all wrapped up in one neat little homicidal package. There is an obvious danger in featuring such a mixed up character in a film of this type, however, Tiffi really makes the walking cartoon character that is Flavanoid work. Another stand out in the film is actress Jackie Zane, who plays the large bubbly blond Flavanoid groupie. Early on in the film, Zane's character is nothing more than a mascot to the crazed director who provides her own cute comedic charms to the film. However, as the film moves forward she transforms to a protagonist who will stop at nothing to fulfill her sexual desires for Flavanoid. While working on his first film, "Attack of the Atomic Reptiles", Buddy Flavanoid discovers a very effective way of dealing with anyone who doesn't "share his vision". He simply kills them and buries their body. During the long history of horror, murders have always had their 'signature' object for dealing out death. Jason had his machete, Freddy had his finger razors and Buddy Flavinoid has his baseball bat. After "Atomic Reptiles" tanks, Flavanoid is reduced to squeaking out a meager existence as a bathroom attendant, until one fateful day a mysterious investor comes forward to fund his unmade classic, "Attack of the Slime People." The ring of the cash register speaks very loudly and the studio who once used the films script to hold up a table is now courting the eccentric director. Flavanoid agrees to make the movie under one condition, it has to be made 'his way', no questions asked. To make a long story short, things don't go as planned on the set of "Attack of the Slime People" and before you can say, 'play ball', Buddy and his bat are back at work. First to go is the annoyingly persistent actor who thinks he is perfect to be the film's leading man. Buddy, of course, likes the handsome greaser who does a very bad Elvis impersonation as his lead. Despite prodding from the studio to cast the over-eager actor in the production, the director sticks to his 'vision'. 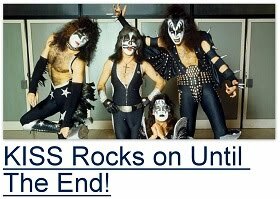 When the studio finally has had enough, they threaten to cancel the filming. Feeling trapped, Flavanoid gives the would-be star a good old bonk on the head. Things quickly unravel for the film maker and one murder begets another and another, and soon he is swinging his 'Louisville Slugger' around like Manny Ramirez trying to take out anyone and everyone. 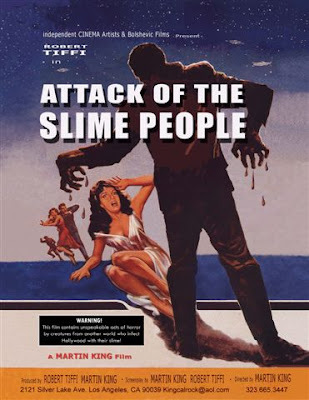 "Attack of the Slime People" is a very entertaining, goof-ball comedy with over-the-top, cliche, characters. Director Martin King does a really good job assembling all the films eccentric elements to produce something that is more than the sum of these parts. If you are a fan of old B films, and have a kinda warped sense of humor, than this one may be to your liking.